There are many places to hike in and around Meldrum Bay. One of the shorter trails runs behind Water Street (where the cottage is located) through the woods and exits at the Meldrum Bay Community Centre. 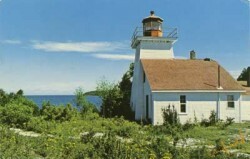 You can also hike at the Mississagi Lighthouse (described under Local Attractions). You can walk along the waterfront on the limestone that goes right to the water’s edge. The Sheshegwaning First Nations are developing a 20 km trail which can be enjoyed in several sections, some offering beautiful views of the North Channel. There are facilities for camping and picnicking. Maps are available at the Band office or the Gas/Convenience store at the beginning of the trail. (see Sheshegwaning and Zhiibaahaasing described under Local Attractions). Misery Bay Provincial Nature Reserve which is about 20 minutes away from Meldrum Bay is a provincial park on the south shore of Manitoulin Island just west of Evansville. There are two trails of about 5 kms and 4 km which feature mixed woodland, old beach ridges and rare alvars. There is an interpretive centre that is open in the summer. Go to http://www.manitoulin.com/misery-bay for more details. There is a new natural environment Provincial Park called Queen Elizabeth The Queen Mother Mnidoo Mnising (Queen Mom) just about 15 minutes east of Meldrum Bay covering 6,500 hectares. It’s a nice walk out to Belanger Bay on Lake Huron mostly flat on alvars with fossils embedded in the rock. For other hiking trails, go to http://www.manitoulintourism.com/Hiking.htm.